Perform a boundary survey and sectional breakdown for 10 sections of land and prepare and process a Record of Survey with the County of Riverside for the Mecca Group. 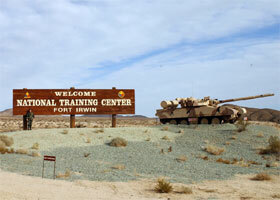 Re-establish the 100-mile boundary of Fort Irwin as a subcontractor for Charis Corp. The survey monuments were originally set in the late 1800's and early 1900's but there was little record of the monuments having been found. There were few roads or trails in this hilly terrain so it was necessary to utilize all terrain vehicles in order to perform the GPS survey. Most of the original monuments were found and the lost monuments were replaced according to Bureau of Land Management procedures. Locate centerline and boundary utilizing RTK and Fast Static (GPS) to establish the boundary and create Record of Survey Maps for three tank facility sites at Del Rosa #1, Ogden Street, and Medical Center Drive for the San Bernardino Municipal Water Department. 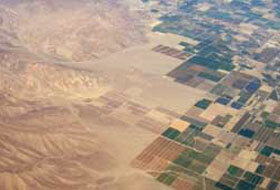 Also at the Del Rosa #1 site we located existing utilities to update and create a new plant map. Establish control for aerial mapping and boundary survey for the design of site plans and access roads in steep terrain for tribal multi-purpose building and spring water plant for the San Manuel Band of Mission Indians. Work included construction management and all phases of construction staking.